“There are a multitude of reasons for attending a mystery conference or convention, and many of them to choose from. I’ll tell you about both and what has turned out to be the most satisfying part of going to them for me. “Bouchercn in Milwaukee was my first experience with this great and huge mystery convention. I didn’t know many people who attended though I certainly recognized the big name authors, some from photos on book covers, others from their name tags. One of the booksellers was willing to sell my books that I hauled with me, taking such a big percent I made nothing. Didn’t make much difference, I think only two or three of the books were purchased. “There were so many exciting sounding panels it was hard to choose which ones to attend, but I filled my days with them. Hubby had a great time going to the Harley-Davidson Motorcycle Museum and a brewery. “My first Left Coast Crime was in Monterey. This time hubby stayed home, but several of the women from the San Joaquin chapter of Sisters in Crime attended. 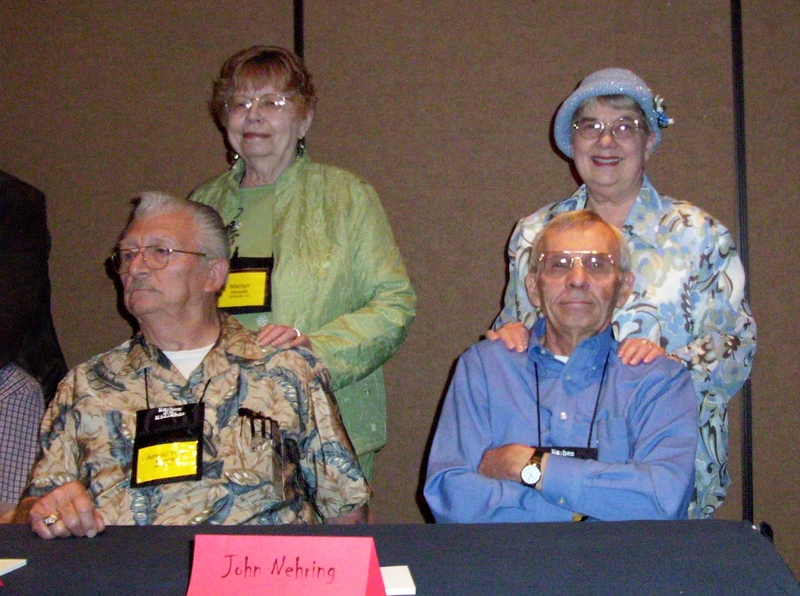 Besides them, I actually ran into some of the people I’d met at that first Bouchercon. I also met more writers that I admired. I was on a panel, but had no books to sell. “I don’t really know what came next because I went to all sorts of conventions and conferences after that, including some that no longer exist. Among them, Mayhem in the Midlands, which was one both hubby and I looked forward to every year. We made friends with lots of readers, people who lived in Omaha where the conference was held, and fellow writers. Though some big name writers attended this conference more midlist writers came. Among them were Radine Trees Nehring (whose blog I’m visiting today) and her husband, John. “Over the years, we looked forward to spending time with the Nehrings, sharing at least one meal with them, and visiting about writing, promotion, and living in general. Sometimes we were fortunate to see them at more than one conference during the years. We truly formed a bond with them both, something that would have never happened if we hadn’t gone to all these mystery events. “Being a writer can get lonely at times. Of course the Internet has helped authors and readers connect with one another, but it’s not the same as sitting down and having a conversation with someone and getting to know them. And that’s what you can do at a mystery conference or convention. “Over the years, I’ve met so many wonderful people, some readers of mysteries and of course writers of mysteries. Now when I go to a convention or conference, it makes me feel like I’m attending a reunion of old friends. Sure I’m going to promote my latest book by handing out cards, hopefully getting to be on a panel, and having the book available in the convention or conference book store. The best part though, will be connecting with all the wonderful people that I’ve met over the years. “The book I’m promoting right now is the latest in the Rocky Bluff P.D. series, No Bells. F. M. Meredith, also known as Marilyn Meredith, is the author of over thirty published novels–and a few that will never see print. Her latest in the Rocky Bluff P. D. crime series from Oak Tree Press, is No Bells. Rocky Bluff is a fictional beach community between Ventura and Santa Barbara and F. M. once lived in a similar beach area. Yes’m! Conventions and Conferences are great — especially if Hap and Marilyn are there!!! Thanks for coming to my blog, Marilyn. At least we can meet this way. And, sorry, our feeble Internet service wouldn’t let that “terrific” photo of the Merediths and Nehrings upload. (We really tried and are planning now to take the laptop to a wifi place and see if we can add it that way–maybe separately. Readers here may need to go to another blog post to find it! ) Maybe by next time we’ll have better Internet service at our home. CAN YOU BE AN HONORARY HILLBILLY? YOU DECIDE! I suppose the title “Hillbilly” could define a place of birth, maybe an occupation, creative ability, music preference, family connections. But it is also a state of mind. To me, it’s practical use of intelligence and inventiveness. It’s family devotion. It’s appreciation of values above the merely material. It’s awareness of things going on, especially in our more untouched areas, that–dare I say it–the outside world often isn’t aware of. And it’s magic. I’m guessing most of you do not live in the Ozarks, and, when you think of a hillbilly you … well, you know what you think. However, as I believe you guess from what I said above, I don’t want you to let the stereotype fool you. (I have some experience in this matter.) So, how would you like to be an honorary hillbilly? The first step comes from using our senses. You can do that anywhere, but it’s not as easy in non-hillbilly places. Walk in the Ozarks woods. What do you hear, see, smell? When you touch something, what does it feel like? Tree bark? A rock? Smooth? jagged? Broken? Sharp? Let your fingers run over the rock while you sit on a log or a bigger rock or, if you prefer, just stand still and wait to sense the world around you. This sounds quite simple, but in today’s world, it too often isn’t. Be quiet, really quiet. Have you noticed how many people today can’t seem to be quiet? Something has to be going on all the time, fingers moving, screens flashing, feet jiggling. It’s becoming quite noticeable, and the fairly new term “nature deficit” is one you may have heard. Instead of quiet, something has to be going on all the time. So, try this honorary hillbilly gig. Forget “civilized” society, and, if you can’t find woods, stand by a tree, on grass, and put your hand on the tree’s trunk. This is a good step toward becoming an honorary hillbilly. There is a verse in the Bible in First Samuel where Abigail says to David: “The soul of my lord shall be bound in the bundle of life with the Lord thy God.” I like the term “bundle of life.” I suspect that what Ozarkers and visitors to the Ozarks feel and experience here is bound up in the bundle of life as it has happened here for a very long time. As we listen, observe, feel, we’re bound in the beautiful experience of our Ozarks. What you will see in hillbilly woods is not a world corner-squared and organized. It isn’t even, like many northern forested areas, pine-needle cushioned, pillered with tall trunks, and open for walking. It is not defined by the words lush or soft or easy. If you aren’t on an established path you’re likely to be caught by brambles, stumble over rocks, and get poked by branches. It’s a tough landscape, rocky, irregular, bumpy, scratchy. The soil is shallow, especially where forests have been cut, so things have to work hard to live in the country here, people included. The term “lazy hillbilly” has to be one of the most inexplicable denominations in the English language. Well, I’ll stop my rant here. But I would love to have you in my group of honorary hillbillies. The benefits are all yours! OHMYGOODNESS . . . It’s a real person! I’m reading a delightful mystery novel right now (NO BELLS, by Marilyn Meredith) and, because of rather unique circumstances, am experiencing a “hiccup” every time one character’s name is mentioned–which comes up frequently. First, let me explain that it is the practice of many authors to honor people by giving book characters a real person’s name. This can be an individual decision by the author (with permission from the “namee,” ) or, frequently, the right to have a book character named after yourself or someone you want to honor is auctioned at writers’ conferences to raise money for a cause related to writing and reading. So, finding real names in books is not uncommon, even when the book is not a historical novel or a biography of some “worthy” person, past or present. So, why the hiccups? Because I KNOW the real, living, (delightful) person so honored in this book. It’s never happened before in any work of fiction I’ve read, but, every time the name comes up, I see and hear the person I know, not the book character. It is a unique, and somewhat bizarre reaction on my part, and, to some degree, it interrupts my involvement in the story . Odd, because one thing I love most about this on-going series set within the lives of various members of a police department is my belief, while reading, that these are all very real people, living real lives, and I am privileged to be hiding (a fly on the wall) to know their thoughts and actions. In other words, this is one of my favorite novel series, ever. That said, have I ever used real people in my own books? Yup, I sure have. Twice I’ve used people who actually played the parts in novels that they play in real life. One was a ranger who was very much involved in helping me develop the setting and plot of A RIVER TO DIE FOR, a story that takes place mostly in the caves and abandoned mines at Buffalo National River in Arkansas. It turned out to be challenging to write him into the story. Though he was eager to be part of this work of fiction, I didn’t want to “make” him do anything he might not do in real life. Truth be told, I didn’t want to upset either this man or his bosses. Everything came out okay, but it was a challenge I wouldn’t repeat. In JOURNEY TO DIE FOR, I used Chuck Dovish, host of a popular PBS program called “Exploring Arkansas” as part of the story, filming a ride on a restored 1920’s passenger train as Chuck has actually done more than once for his program. In this case I had no problem because Chuck simply did in the novel exactly what he does for AETN. And, when Carrie McCrite, Henry King, and their friends view the resulting program in the story, they discover a valuable clue to a murder that occurs following their ride on this (real) train. It was great fun all around. In my latest novel (A FAIR TO DIE FOR, to be released by Oak Tree Press later this spring), I again use the names of two real people as a big part of the story. One, Carrie’s mysterious cousin, Edith Embler (“Edie”) is named in honor of the real person by the same name who was a reviewer for “I Love A Mystery” review site, and became a real-life friend of mine when she and her husband came to Arkansas to visit the locations where my novels are set. I enjoyed my time with this delightful couple. Edie passed on shortly after their visit, and I, along with other writers who knew her, promised to honor her by naming a book character after her. I have done that in this story. The second real person, who has been a frequent poster to the mystery fan site, DorothyL, is John Bohnert, who, among other things, often told DorothyL members what delicious-sounding meals he was cooking. I don’t know John face-to-face as I came to know Edie, but he is definitely a real person, and appears in A FAIR TO DIE FOR as famous Chef John Bohnert from Grass Valley, California. In spite of what I’ve just written, I don’t often have any problem with confronting real names in fiction, mostly–as I have discovered–because I don’t really know them and can’t picture a real person owning the name. In the case of the character in NO BELLS, I’ll gladly put up with it because I know the name honors a friend of the author’s, and of mine! My goodness, but published authors do get asked a lot of questions. (Probably some unpublished authors do too, though no one asked me questions–at least not about writing–in my pre-pub days.) But, are we really THAT interesting, once we have had a book published? I suspect those wanting answers to various questions (1) think writers are rather, um, ‘peculiar,’ and they’re curious about what makes us tick. (2) They are authors themselves and want to know what ways other authors are using their talents and operating their business that may be different from their own. (I admit to this interest.) (3) They like a “this is your life” sort of exposé about anyone, or (4) they’re always eager for something new to gossip about, and writers (being peculiar, you know,) are great sources for gossip. I’ve recently been given lists of questions by several sources–blog hosts, magazine editors, and so on. Fortunately I have always thought answering questions was fun (I love responding to surveys), so filling in the blanks is never annoying or boring. I labor away, trying to make my replies sound like good sense. Question: What activity (cause, charity, or organization) consumes your time when you’re away from the keyboard? Answer: I am active in my church, but, in addition, I currently serve as mentor for several beginning writers. That doesn’t mean I’m an editor. I chat with them on line, meet with them, praise the talent I see and the value of their work, talk to them about promotion, give them guides to possible publishers, encourage them to keep going–that sort of thing. I had someone to cheer me on when I was writing my first book, and I know how much it meant to me. I might never have been published if it hadn’t been for Peggy Fielding of Tulsa, OK, (where I lived at the time). Question: Have you ever experienced writer’s block? Answer (expanding on what I told Anne): It may seem dumb, but, as much as I see it discussed, I’ve never been truly sure what writer’s block is or how it manifests itself. Does anyone reading this have a definition? Please share! OR . . . does it mean being stumped in the middle of an article or story about what to do next? (Someone said the answer to that for mystery writers was simply to kill someone else.) Though I don’t outline, and discover my stories as I write (as accomplished and prolific author Carolyn Hart once said about her work), I begin each writing session without ever feeling I am going to have trouble putting down what happens next. Honestly folks, the ideas just show up. But then, I have always had an overly lively imagination. Of course sometimes ideas don’t work, but it only takes a page or two for me to realize I’m off track. I have tremendous fun finding out what Carrie McCrite, Henry King, Shirley Booth, and all the rest are going to experience next! You are currently browsing the Radine's Weblog blog archives for April, 2012.